This table was developed in the early 1900s, a German engineer named Richard Mollier. This is a graph (Fig. 1.31)that represents the properties of moist air from the point of view of the dry bulb, the wet-bulb temperature, relative humidity, humidity ratio, and enthalpy. Three of these properties is sufficient to determine the status of moist air. It is important to note that the chart can be used only for the atmospheric pressure (i.e., 1 atm, or 101.3kPa). If the pressure of different humid air equations can be used. Understanding the dynamics of air humidity and will provide a solid Foundation for understanding the principles of the refrigeration and air conditioning systems. Fig. 1.32 shows multiple processes on the psychrometric chart. Fig. 1.32a exhibits cooling and heating processes and therefore an example of increase and decrease in the dry bulb temperature. In these processes, the change of sensible heat are found. There is no latent heat involved due to the constant moisture ratio of the air. Fig. 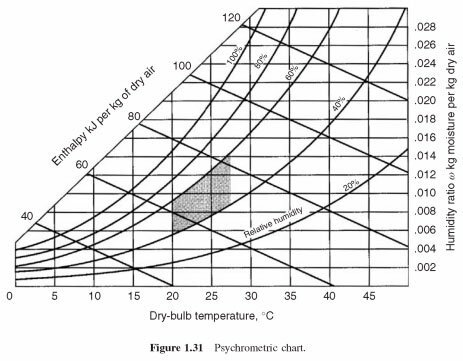 1.32b example of dehumidification on a constant dry-bulb temperature with the decrease of humidity ratio. A very common example is shown in Fig. 1.32c which includes both the cooling and dehumidification of the air, which led to a decline in both dry bulb and wet-bulb temperature and humidity ratio. Fig. 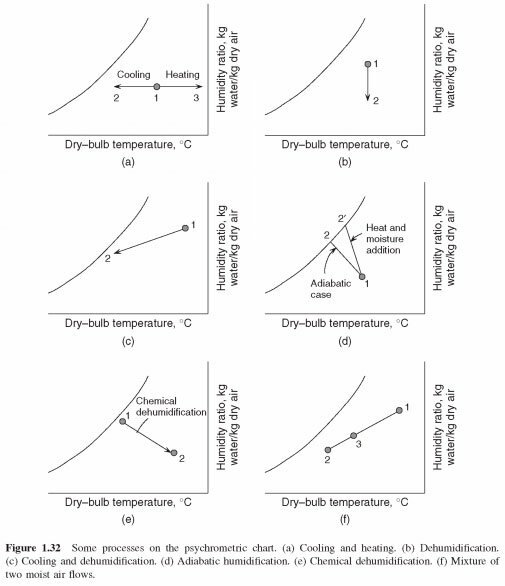 1.32d exhibits humidification of adiabatic constant wet bulb temperature (1-2), for example, spray type of humidification. If this is done with heated water, the result will be (1-2'). Fig. 1.32e displays chemical dehumidification, as water vapour is absorbed or adsorbed from the air using an absorbent material. He is isolated because of the constant enthalpy humidity ratio decreases. The last time (Fig. 1.32f) is the process of blending two streams of air (i.e., one is able to 1 and the other in condition 2), and their mixture reaches the state of 3.